Looks like after September 1st, Delta passengers flying in premium cabins will be offered the hard and soft cased TUMI kits. The kits will be available on all Delta One flights, including coast-to-coast flights between JFK and LAX/SFO, BOS-SFO and DCA-LAX, and will feature the hard- and soft-cased TUMI kits. The cool part is you can have them custom monogrammed for free at retail TUMI locations. Included inside will be a patch that will be required upon request to have them monogrammed. 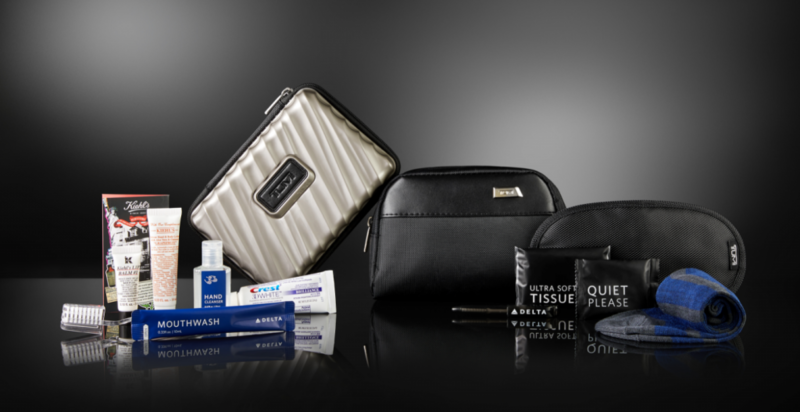 The new TUMI kits will include hand cleanser, mouthwash stick, TUMI eye shades, and updated striped socks, along with travel necessities such as lip balm by Kiehl’s, a dental kit with Crest toothpaste, tissues, and ear plugs. You can read more about it on Delta.com. Customers flying in the Delta Premium Select cabin, will be gifted with the soft TUMI blue pouch, which includes Malin+Goetz lotion, a dental kit, eye mask, socks, and ear plugs. You can read more about the TUMI kits and the refreshed changes at Delta.com. TUMI is undoubtedly awesome at making amenity kits, and I hope to book myself on one of these flights just to score one. Let me now if you get one and what you think of it. Also let me now which amenity kit you like the best. Happy Travels. Delta Airlines will offer FREE movies & TV, and Booze in Coach!! Coming to a plane near you! Delta Airlines today announced they will offer free movies and TV shows in their economy comfort class on transcontinental flights. This will surely make the time go quicker, and more comfortable for some on those east coast to west coast flights. No more paying $6.00 for in-flight entertainment (that should’ve been the norm in the first place). They will offer up to 100 movie selections. You will though have to provide your own headsets. I always take mine on the plane anyways. Starting in April, economy comfort class passengers will receive free beer, wine, and other spirits, and (drum-roll please)…enhanced snacks!!! I’m assuming this will be more than just a pack of pretzels, or peanuts. I’m glad to see they are compensating fliers with at least something. Delta hasn’t exactly been nice to the mileage community, with their devaluations and changes, that are coming up. Now, will I start collecting SkyMiles to experience all this first hand? Probably not, as I expect these so called amenities to be the norm. But then again, I don’t like to fly coach from coast to coast, unless I have to. However, it’s good to know this option is available. HURRY! Cheap Alaska Airlines Fares!